Breast implants are not intended to last for a patient’s entire lifetime. Most breast implants retain their integrity for approximately 10 years before necessitating replacement, either because of changes in personal preferences or complications, such as breast implant failure. When a patient experiences implant damage or rupture, it is imperative to have the implants surgically removed or replaced by a knowledgeable and qualified plastic surgeon as soon as possible. Dr. Stuart Linder is a board-certified breast surgery specialist who has delivered outstanding breast revision results for patients with deflated breast implants from around the world. 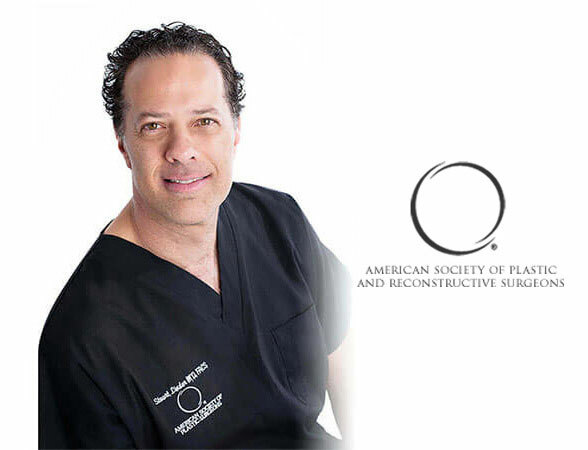 He utilizes a range of modern techniques to eliminate the risks associated with damaged breast implants and revitalize the aesthetic of the breasts. Dr. Linder also provides ample information to every patient so they understand the details of their procedure throughout the process. When saline breast implants rupture, they deflate rather quickly and produce noticeable volume loss as well as an abnormal appearance. Other types of implants, including silicone gel-filled and gummy bear implants, usually require an MRI to confirm breast implant deflation because the ruptures are often asymptomatic. Saline implant ruptures can be caused by valve leakage or damage to the silicone shell. Most patients with ruptured saline implants notice a sudden deflation of the affected breast(s), resulting in a distorted or uneven appearance. Some patients experience breast pain or swelling. If an infection occurs, it is often characterized by redness or fever. While the sterile solution filler is safely absorbed into the body after saline implant rupture, the breast pocket may be compromised if a revision or implant removal procedure is not performed soon after a rupture has been diagnosed. Ruptured silicone breast implants generally do not deflate because they are filled with cohesive gel rather than liquid. Instead, the gel leaks slowly and spreads into the implant pocket. In some cases, the leakage is intracapsular and eventually becomes extracapsular, migrating to other areas of the body. The most accurate way to detect silicone implant rupture is by MRI, which are recommended three years after the initial breast augmentation and every other year following. Patients with ruptured silicone implants can experience silicone mastitis or develop calcified granulomas as well as other conditions. Gummy bear breast implants contain highly cohesive silicone gel and are commonly used in breast augmentation procedures due to their form-stable nature and firmness. However, when gummy bear implants rupture, patients can develop granulomas and calcifications as well as infection. These types of implants are also more likely to rupture because of their textured surface. Gummy bear implant failure can be determined with an MRI, but women are advised to see their doctor if they experience noticeable symptoms of a rupture, such as pain, redness, swelling, or fever. Polyurethane breast implants are silicone gel implants coated in a polyurethane surface intended to minimize the risk of capsular contracture. However, the Committee on Carcinogenicity (COC) determined that these implants produce carcinogenic effects as the shell degrades over time. Because of this conclusion, they are no longer used in the United States. Ruptured polyurethane implants, like silicone implants, often do not initially cause symptoms and must be diagnosed by MRI. Failure to address ruptured polyurethane implants can result in distortion of the breasts in addition to infection, pain, and other side effects. Dow Corning breast implants are filled with liquid silicone, which poses severe risks due to its migration capabilities. These devices were first introduced in the 1940s and had been known to rupture easily, with implant failure rates as high as 95 percent within 12 years of an initial breast augmentation procedure. Other significant complications (including granulomas, capsular contracture, and mastitis) are also common in patients with Dow Corning implants. Many patients with these implants experience total disintegration of the implant shell, which allows the liquid silicone filler to affect the surrounding breast tissue and capsule. Becker breast implants were designed to provide the benefits of both silicone and saline implants during breast reconstruction surgeries. They consist of a gel core and adjustable inner shell that is filled with saline solution. Ruptured Becker implants are identified by MRI, mainly because of the slow leakage that can occur with the silicone gel in the outer chamber. Patients with ruptured Becker implants are generally asymptomatic, so it is crucial to schedule MRI appointments regularly to check the integrity of the devices. In 1968, Heyer-Schulte manufactured the first saline implants. While these implants had a thick shell, the subsequent silicone gel-filled Heyer-Schulte breast implants were created with alarmingly thin shells. Due to the fragility of the shell, they have been known to dissolve over time, leading to migration of the gel filler. Ruptured Heyer-Schulte implants can also cause mastitis, calcification, capsular contracture, and other complications. Rupture of silicone Heyer-Schulte implants can be diagnosed with MRI. B-Lite® breast implants are manufactured in Germany and are not FDA-approved for use in the U.S. These implants are encased by a silicone shell (much like traditional silicone and saline implants) and come in both round and anatomical shapes as well as various textures. However, the filler material is made of a composite material containing cohesive silicone gel and hollow borosilicate microspheres. The result is a lightweight implant with a lower rate of gel migration than other cohesive silicone alternatives. Patients who underwent their initial breast augmentation with B-Lite® implants in Europe and experienced implant rupture often seek Dr. Linder’s help for explantation or implant replacement. One of the options for women who have experienced implant rupture is implant removal. This approach involves making an incision (usually along the original breast augmentation scar, if possible), taking the implant out, and irrigating the breast pocket with an antibiotic solution. The scar tissue capsule may also be removed during this procedure. Patients with significant skin laxity may combine their implant removal with a breast lift to restore their breasts to a more youthful appearance. Patients with leaking breast implants who wish to replace their implants may consider breast revision surgery. Breast revision maintains the fullness of the breasts by exchanging ruptured implants with new devices. If a patient believes their implants have ruptured, they must contact their plastic surgeon. It is crucial to undergo this procedure immediately to achieve the best results. Neglecting to address ruptured implants may lead to the development of excessive scar tissue and compromise the appearance of the breasts. Capsular contracture is a complication commonly associated with ruptured breast implants. This condition is usually characterized by hardness, pain, and an irregular appearance of the breasts. Capsulotomy is a surgical procedure that expands the breast pocket to soften the tissue. Capsulectomy involves removing the entire capsule. The technique used depends on the severity of the patient’s unique condition and whether or not they desire implant exchange. “Dr. Linder is the best implant surgeon EVER, I HIGHLY recommend him as he’s saved my breast countless times and I only trust his BEAUTIFUL WORK.” - J. F.
“I must tell you, I am free of pain in my breasts. I feel so much better now since my surgery(removal of ruptured implants), last Thursday. You and your staff are such caring & professional people. I feel I had the best care in the entire world. Thank you so very much for taking such good care of me. My husband thanks you too.” - A.P. Is Dr. Linder certified by the American Board of Plastic Surgery? Absolutely. There are no substitutes for certification by the ABPS. What is the warranty for my implants? Both Allergan and MENTOR® offer warranties for their breast implants. Patients who opt for Allergan products are offered the ConfidencePlus® warranty for silicone-filled implants or the ConfidencePlus® Premier warranty for saline implants, both of which come with lifetime implant replacement policies. All MENTOR® implants are covered by a Lifetime Product Replacement Policy, which states that the manufacturer will provide implant replacement (with the same or similar product) at no additional cost. Where can silicone gel migrate after a silicone implant rupture? Ruptured silicone implants may result in silicone gel migration outside of the breast capsule (extracapsular rupture) and into the chest wall, underarm, abdomen, or lymph nodes. How can I check my breast implants for signs of rupture at home? Women with breast implants are advised to routinely check their breasts for irregularities, such as lumps or distortion. Changes in the appearance and feel of the implants may be indicative of rupture or other complication. If you notice a difference in your breast implants, please contact your plastic surgeon and schedule a professional examination.